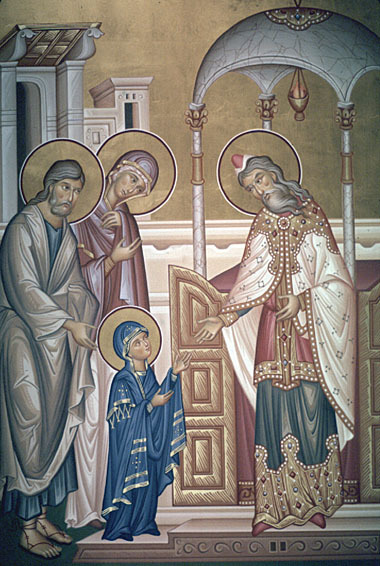 In Eastern Orthodox tradition, this is one of the days when women named Mary (Μαρία in Greek) and Despoina (Δέσποινα in Greek) celebrate their Name Day. It was celebrated in the East as early as the Sixth Century. It was introduced in the West by the agency of Philippe de Maizieres, envoy of the King of Cyprus to the papal Court of Avignon. He described the festival as celebrated in the East in such glowing colors that Pope Gregory XI introduced it into the Calendar of the Curia. The feast originated as a result of the dedication of the Basilica of Saint Mary the New, built in 543 by the Byzantines under Emperor Justinian I near the site of the ruined Temple in Jerusalem. This basilica was destroyed by the Sassanid Persians under Khosrau II after the Siege of Jerusalem (614). The first documented celebration of the feast in any calendar is the mention of the Εἴσοδος τῆς Παναγίας Θεοτόκου (Entry of the All-Holy Theotokos, i.e., into the Temple) in the Menologion of Basil II, an 11th-century menology of the Eastern Roman (also known as Byzantine) emperor Basil II. The feast continued to be celebrated throughout the East, was celebrated in the monasteries of Southern Italy by the ninth century, and was introduced into the Papal Chapel in Avignon in 1372 by decree of Pope Gregory XI. The feast was included in the Roman Missal in 1472, but was suppressed by Pope Pius V in 1568. As a result, it did not appear in the Tridentine Calendar. Pope Sixtus V reintroduced it into the Roman Calendar in 1585. Pope Clement VIII made this feast a greater double in 1597. Mary was brought by her parents to the Temple at Jerusalem in order that the Rod of Jesse from whence the Flower of Nazareth would blossom should be preserved from all danger In the shadow of the sanctuary. This should be a lesson to all, but especially to parents who cannot guard the innocence of their children more surely than by accustoming them from an early age to prayer and to frequent reception of the sacraments. God, Who wast pleased that on this day the Blessed Virgin, the dwelling place of the Holy Spirit, should be presented in the Temple, grant, we beseech Thee, that, by her intercession, we may deserve to be presented in the temple of Thy glory. Through our Lord Jesus Christ, Thy Son, Who liveth and reigneth with Thee in the unity of the Holy Ghost, God, Forever and ever.